What would be more a fitting theme than starfish for a beach wedding?! A popular choice for sure, but I chose to do it a little differently by using real starfish! Well, dried ones, anyway. You can buy these starfish at most any craft store and online, in many different sizes. The larger they are the more heavy they tend to be, so you will need to experiment a bit with different weight papers against different sizes of star fish until you have just the right ratio. Selecting the right glue is paramount! You need a combination of glues actually. One for holding your paper layers together, and one for getting that starfish to hold onto the front without warping the paper. Step One: Printing the wording on the invitations. I actually printed the wording for the inside of these beach wedding invitations onto a separate paper rather than printing straight onto the card. I just think it adds a little extra emphasis when creating a folded card. Not to mention, the color of the paper matched the color of the starfish on the front perfectly. For this particular card I used an 8 1/2" by 11" piece of cardstock to create the folded card. I simply cut the cardstock in half and then folded each half to create a 4.25 by 5.5 inch folded card. 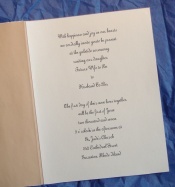 SO, to print the wording for the inside of the invitation, the wording would need to be printed onto a 4.25 by 5.5 piece of paper. There's a couple ways to go about doing this. 1. you could cut some paper into quarters and then print straight onto them with your computer printer. 2. Print the wording four times to a single sheet of paper and then cut it into quarters. I even happen to have a free invitation template available that will help you easily do just that! Step Two: Cutting and Folding the card stock (create a folded card). You could certainly go out an purchase blank pre-folded cards and envelopes for this project. It would certainly make life easier. BUT, if you would just as soon save a bit of money, or you want to use a very particular color and texture of paper, then making cards the DIY way is the way to go. I chose a standard 8.5 by 11 inch sheet of paper. But remember, if you are making them yourself you can make them any size you like. I am also very fond of using 12 by 12 inch paper to make 6 by 6 cards, which I happen to think very chic for a wedding invitations. To create your folded card is simple. Start by cutting the cardstock in half. Score the half sheets of paper across the middle where you intend to fold the paper. Fold the paper across the score. Viola! Step Three: Embellishing with decorative paper. I chose a beautiful embossed piece of decorative scrapbooking paper. You can find the same kinds of papers from sellers of handmade papers. My absolute favorite paper store for this sort of fancy paper is Creative Papers Online/Handmade-paper.us. They have a fantastic selection. I personally shop their so I can vouch for their service! AND a big plus is that they also have a paper cutting service so you can get your papers cut for you ahead of time! If you are cutting them yourself? Well it's a bit tedious but saves money, that's for sure! Lol! To get down to business - You want to cut the decorative paper to fit over about 2/3's of the page. In other words, whatever the size of the front of the card - minus a couple of inches in width. You can certainly use the paper as is and attach it to the card. But I went a step further and added a decorative border to the right hand side edge of the paper. To apply the decorative edge I simply used a lacy border punch. Anything lacy or scallop edged should work quite well. The best way to attach the paper to the front of the card will depend on the texture of the paper. I'm really font of double sided tape and adhesive runners. Some have reported that a high quality glue stick is a good choice as well. But I find that glue sticks don't work well for the long run. The last thing you want is to find that the invites fell apart in their envelope in the mail! Pick you best glue option and simply attach teh paper to the left side of the card lined up with all three edges. Step Four: Adding the starfish! Well beach wedding invitations do need something "beachy" about them! Like I've said before, you can use any ornament. I just happen to choose dried starfish. You could add sand dollars, or sea shells, or even some die cut pieces such as seahorses or palm trees. Make it your own! Try to choose a size of starfish that is not too heavy for the thickness of cardstock you have chosen. 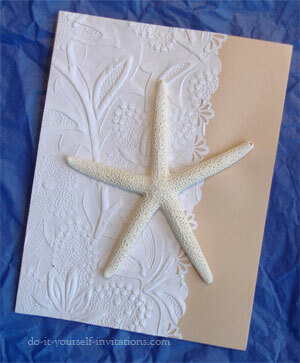 I made these invites somewhat small to accommodate for the weight of the starfish. You'll need to use a really reliable craft glue to hold this together. A mini glue gun could be used. My absolute fave glue is Scotch's quick dry adhesive. It is light but holds very well and dries fast. Simply glue the starfish (or whichever ornament you choose) to teh front of the card and you're done! You've created gorgeous and unique beach wedding invitations that will "wow" your guests! 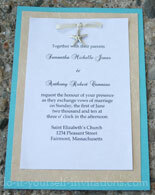 Here's a cheap and creative way to add "starfish" to the front of your invites! Make them yourself! You can create unique handmade starfish ornaments using super light weight and easy to work with paperclay! It needs no oven to set, only air dries, and it is relatively cheap. If you can get your hands on a starfish soap mold your golden! Simply pop open a package of paperclay and knead the "dough" to make it smooth and pliant. You can even work in some pigment with cream colored paint, or buy some colored clay. If you have a soap mold, then press the clay into the mold and use a butter knife to scrape off any excess. If you have no mold then simply shape them into star shapes. To lend some texture press some course sand paper into the clay. Let the clay dry overnight. By morning you will have super light DIY starfish that will cling effortlessly to the front of your card. Any good craft glue will do! 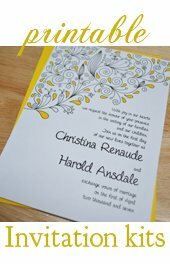 If you want to use the exact decorative paper I used to make these beach wedding invitations, it is made by The Paper Company and is called "white embossed flowers" (#11001-172). I purchased this paper in person at a Michael's craft store so if you have one in your area then give it a try. Making DIY starfish does not have is not the "be all, end all". Check your local craft stores and online for unique beach themed soap and candy molds. You might be surprised at all of the unique shapes you may find.